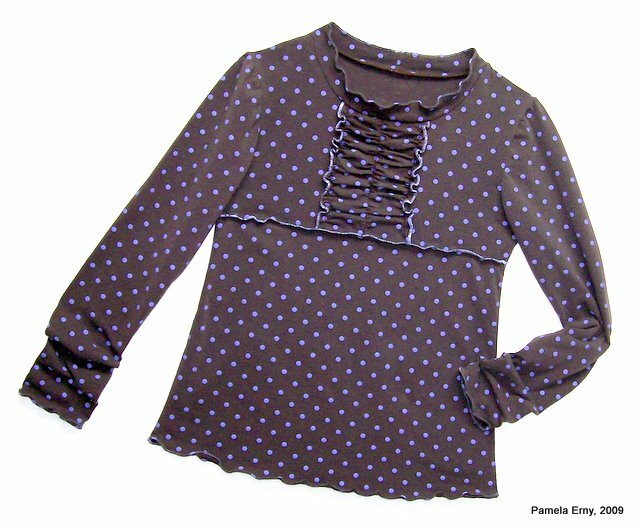 This is the "Dots T-shirt" from the new 06/09 Ottobre Design issue, style #29. This one was made from a soft medium weight cotton/lycra knit for my 10-yr old niece, Willow. In order to get as much gathering in the center panel as I wanted, I added an inch to the length of the panel as I was cutting it out. Willow has long arms, but the sleeves on this pattern are very, very long...meant to be worn over the hand. After the shirt was sewn, I realized that Willow, as neat as she is...is still a child :) So to bring the sleeves up I stitched clear elastic onto the seam allowances stretching it slightly as I sewed. To finish the neckline, I sewed a folded band to the neck, then stitched the edge for a loose ruffled look. The hems were also zig-zag stitched, letting the pressure of the foot create soft rippled edges. I can already envision other ways to make this top...different fabrics...perhaps a woven fabric for the shirred panel, perhaps a sheer knit or lace. Oh I have so many ideas...if only I had as much time ! Love the front panel and the rolled hem edges. That's a very cute top. Looks better than a designer RTW! Nice job. That is very cute. I love the gathering treatment at the end of the sleeves. Very smart! It's a very cute top! I love that scrunchy sleeve idea - I may do that for myself! You were quick with the new issue. It's very cute. I love the fabric. This is so cute! The ruffled edge is done with a zigzag and not a serge? Nice! Very cute shirt! I am jealous...I haven't got my Ottobre yet! From the look of yours, I am already putting it on my list! That is very cute.Yes dots T-shirt.This made by soft medium weight cotton.Cotton shirt really comfortable and this design so good. What a fun top! We all need instant gratification project every once in a while.